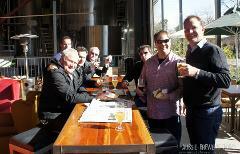 Work up a hard-earned thirst brewin’ some beer with Aussie Brewery Tours! Choose from over 50 different styles of beer and, under instruction from a head brewer, brew your beer on state-of-the-art small-batch brewing equipment. Including transport, snack food, main meal lunch, complimentary beers and 50ltr kettles of beer (around 5 slabs) bottled for you by the brewery - with your own custom labels - and picked up from our Richmond depot (speak to us about having your beer delivered to you). 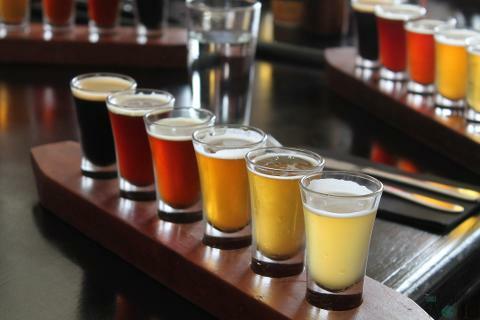 After your brew session and lunch it's time to visit a couple more of Melbourne best craft breweries to sample what your fellow brewing pros are serving up! Your brew: Brew 50ltrs of beer (per booking) on your personal, state of the art, professional brew kit under instruction from professional brewers – choose from a number of different Pale Ales, Amber Ales, Brown Ales & Stouts. Each kettle makes 5 slabs of 330ml bottles. Bottling: We will bottle and label the beer - using your own beer labels - so you don't have to! Pick the beer up from our depot in Richmond (5 weeks between brewing and collection) or organise to have it delivered. Fantastic Food: Brewing is hard work (well, sort off) so we will supply tasting plates of nibblies on arrival plus a delicious main meal from the brewery kitchen (see below for an example menu). Keep hydrated: Brewing is thirsty work (truth) so we you will receive 3 complimentary tap or bottled beers to keep you hydrated whilst you brew. Transport: We will provide the transport (so you can drink) and a knowlegable guide. Extra stops: After the brew day, we will head off to visit Moon Dog Brewery and Stomping Ground Brewery to sample some of the beers your fellow pros are brewing. Complimentary beer included at each stop. Small Group Touring: Enjoy small group (min 8, max 13 people) flexible touring in our customized, air-conditioned mini-buses. 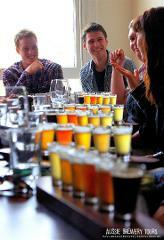 Note: We can accommodate up to 50 people on our private tours. To be fair to other passengers, we ask groups of 7+ to book a private tour as to not unfairly unbalance the group. 2 people = $305pp; 3 people = $259pp; 4 people = $235pp; 5 people = $220pp; 6 people = $212pp. Extras: Add $50 per booking (not per person) to brew an IPA (Pale Ales, Amber Ales, Brown Ales & Stouts including in price).